Kratos Nendoroid Figure by Good Smile | Nerd Much? 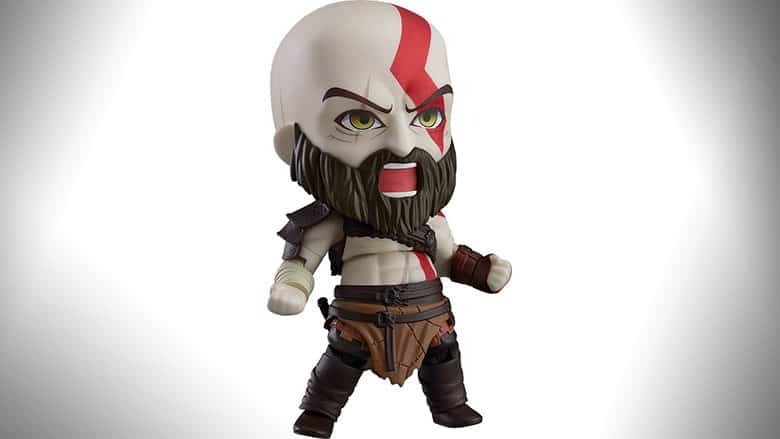 We are excited to announce the upcoming release of the all new God of War Kratos Nendoroid action figure. Straight out of the hit hack and slash action adventure game God of War, this Kratos Nendoroid action figure is sure to be a fan favorite. Have you been busy playing the newest God of War? Released back in April the latest edition to the God of War franchise has been receiving rave reviews. This sequel to 2010’s God of War III, follows Kratos and Atreus Boy on a quest across the nine realms to scatter his late second wife’s ashes. Standing about four inches tall, this fully articulated Kratos Nendoroid action figure has all the right details to bring your favorite god slayer to life. Complete with his trademark pale skin and battle scars, Kratos even comes with the option of a determined expression or a battle expression. With a meticulously designed costume that is accurate to the last detail this figure still keeps true to the character stylization you expect in a Nendoroid. Painted partially by hand, each Kratos figure is unique. Accessories include his golden shield and battle axe. Both the axe and shield are posable in his hand or attached to his back. A fierce addition to any collection, get ready to recreate your favorite battle scenes from the video game. While this Nendoroid does not stand upright on its own, it does include a display stand. Guaranteed in mint condition, and priced at $45.99 (free shipping available on qualifying purchases) from Entertainment Earth, it’s currently available for pre-order. These Kratos action figures are expected to begin shipping in November, so make sure you don’t miss out and pre-order yours today. Buy it at Entertainment Earth here.